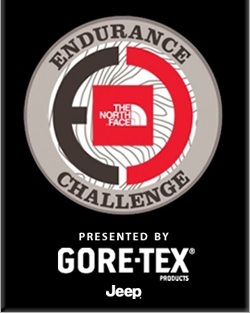 Tomorrow is the North Face Endurance Challenge's 50K! This will be the first time I will run more than 26.2 miles officially (pretty much all of my marathons have been completed in 26.4 miles due to poor routing on my part). Sadly, I really don't have the same level of excitement or worry about this race. It has nothing to do with the North Face people, it's purely because I'm running the distance to run the distance. I have no finish goals in mind. I mentioned to Jill this morning that it's likely because I'm subconsciously freaked out about it. 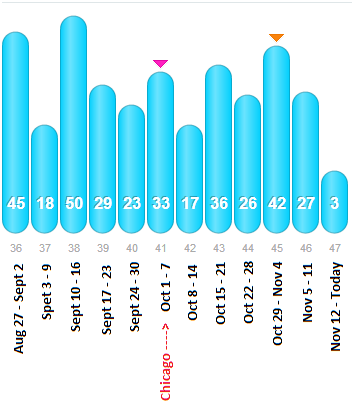 This shows the number of miles per week in the six weeks prior to the Chicago Marathon. Then the next 6 weeks is leading up to the 50K. You'd think I'd have more mileage per week after Chicago. Following Chicago I was having calf issues that took over a week to relent. Interestingly enough, the week I hit the most mileage since Chicago (Oct 29 - Nov 4) I also put in about 70+ hours of work due to downstream impacts of Hurricane Sandy at my day job. How did I manage 42 miles? I had a 15 mile run on Friday and 18.5 mile run on Sunday. Since Chicago, I really only had 3 runs more than 10 miles and those were two of them. Post-race I plan to spend a little time on the bike trainer and maybe one really short run and that is it for the entire week. My next race is the Disney Goofy Challenge and 5K. So I'll be re-evaluating my training plan and picking it backup after I stuff myself with turkey.